Referring to the TMC chief as a 'speed-breaker' once again, Prime Minister Narendra Modi said she knew she was going to be defeated and was having sleepless nights. Prime Minister Narendra Modi was addressing his third rally in Bengal within a span of five days. Kolkata: Prime Minister Narendra Modi on Sunday accused West Bengal Chief Minister Mamata Banerjee of supporting people who want two prime ministers in the country – one for Jammu and Kashmir and one for the rest of the nation. Addressing a poll rally at the sprawling Rash Mela ground in Cooch Behar district, his third within a span of five days, Modi slammed the TMC supremo for her support to the National Conference, whose leader Omar Abdullah had a few days ago sparked a controversy by saying his party would seek restoration of the PM post. “Didi is now tying-up with people who want two prime ministers in the country. Should the country have two prime ministers?” the PM asked the crowd rhetorically. Focussing all his attacks on Banerjee, Modi said she has time and again supported the ‘tukde tukde’ gang to garner votes. Referring to the TMC chief as the “speed-breaker” once again, he said that she knew she was going to be defeated and was having sleepless nights. “She is venting her anger and is attacking her officials as well as the Election Commission. She knows her defeat is imminent,” he said. He also raked up the issue of the National Register of Citizens, which the BJP has promised it will bring to West Bengal after Assam. The issue, a political hot potato, has been a major flash point between BJP and TMC, with Mamata taking the lead among in opposing it strongly. Referring to her opposition to the exercise, Modi said she had betrayed the people of her state by failing to protect them from infiltrators. “The promise of 'Ma Maati Maanush' is on one hand & the truth of TMC on the other hand. Didi forgot 'Ma' and sided with those who raise slogans of 'Bharat ke tukde tukde'. Didi betrayed 'Maati' when she tried to protect infiltrators for her political benefit. When she handed over the people of West Bengal to goons of TMC, she shattered the hopes of 'Maanush',” he said. 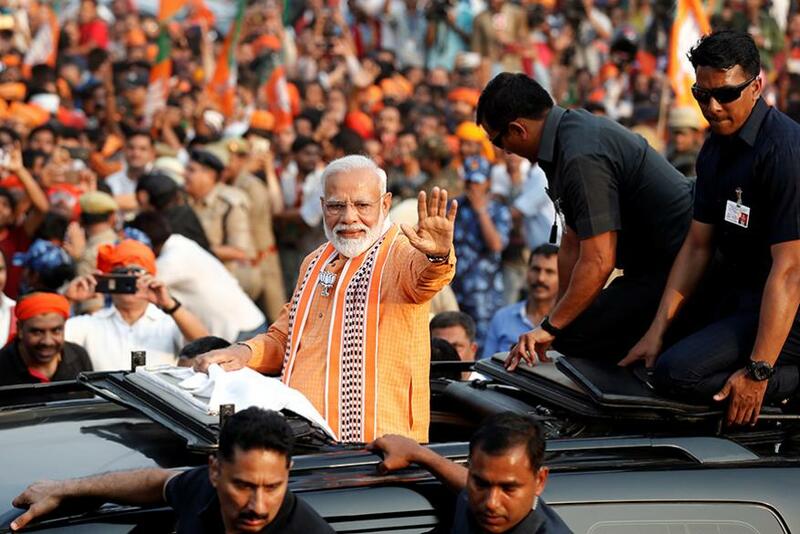 Pointing at the temporary structure that had been built at the venue for his rally, Modi said the Mamata-Banerjee-led TMC had made all attempts to stop the people from coming to attend the rally, and asked if such “childish tantrums” would help her win the election. “This construction is an indicator of Didi’s defeat. This construction has been done to reduce the space for you to stand. The more you chant 'Modi Modi', the more someone loses their sleep. You know who they are? 'Speed breaker',” said the Prime Minister.